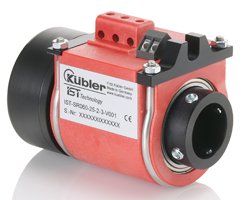 The Kübler SR060, with its dimensions of only 60 mm, is a compact and economical slip ring for up to 3 load (power) and 2 signal transmissions from a stationary to a rotating platform. The SR060 was specially developed for the heating and monitoring of the sealing rollers with flow pack machines. In the food industry, the requirements for cleanliness are paramount. The usual open kit slip rings often give rise to undesired abraded dust particles within the application. The SR060 slip rings however, with their fully encapsulated glass reinforced plastic housing shell and their IP64 protection, offer the ideal contamination-free solution. The rugged design ensures long maintenance cycles of over 50 million revolutions and a long service life of over 500 million. The Safety-Trans™ Design with its two-cavity system for power and signal transmission is a further special feature. The integrated labyrinth seal, which combines internal dust protection with electrical isolation between the power and signal channels, meets the highest quality standards. In addition the Safety-Trans™ construction of the springs ensures reliable transmission even with high levels of vibration. Whilst the pick-off springs used for load currents are manufactured using copper graphite, as this guarantees high abrasion resistance, the pick-off springs for signal currents by contrast are made from a high-grade gold and platinum alloy with 50% gold content. Easily-accessible solidly-built contacts that can be quickly and easily cleaned, a removable maintenance window and brush rings that can be replaced individually all ensure simple, practical use.